The El Rancho Mobile Home Park in Compton, California, a cluster of aging trailers parked on a concrete slab was, nevertheless, an inviting place for low-wage tenants, thanks to its policies and prices. Even blue-collar workers could make the rent; kids and dogs were both welcome. Some tenants — Spanish-speaking house cleaners and baby-sitters, the elderly and disabled — had been there for decades. Although leases, written in English, specified dogs had to be under 25 pounds, the rule had never been enforced. Many households had bigger dogs — several, in fact. So the notice that management tacked to their doors last May sparked panic: Residents had seven days to comply with the original rule or leave. The “choice” was no choice at all — turn in beloved animals at the local shelter or move to…well, nowhere. In a county with the nation’s largest gap between rent prices and average wages, the alternative to a $750 a month apartment is essentially the street. 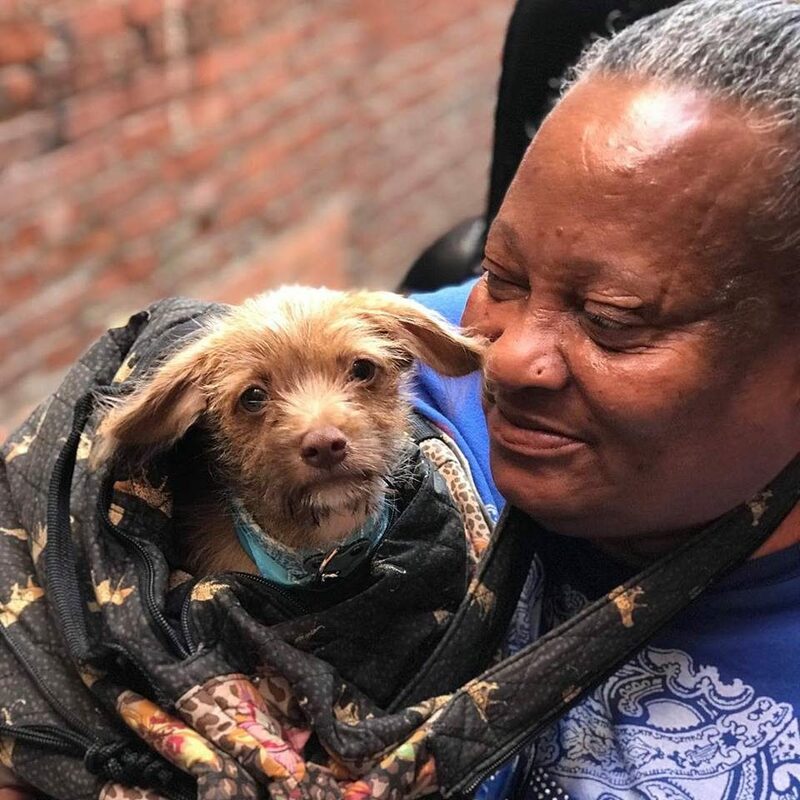 But in early June three residents went to the monthly free animal care clinic run by Downtown Dog Rescue (DDR) in Compton. All had previously had their pets sterilized there, and they’d gotten word that this time there’d be a lawyer present. Longtime housing rights attorney Dianne Prado, sitting not far from the spaymobile, heard their stories and felt a familiar anger rising in her. If the landlord accepted your pets for years, he can’t just say no now, she told them, adding, “This isn’t gonna happen.” Prado made a single phone call to the trailer park’s management company lawyer, Max Eggleston, and with the magic words, “I’m the attorney who represents…” the problem seemed to disappear. (Eggleston says that there was no change in policy, and that tenants have always been expected to “adhere to their leases.”) One of the tenants who’d already surrendered his dog to a county shelter reclaimed it, then phoned Prado crying, with his pet in his arms. Los Angeles-area courts hear some 54,000 eviction cases each year, and no one knows how many more move “voluntarily” at the first landlord threat. Pet issues — sometimes legitimate, often not — are high on the list of why: Evoking a previously unenforced “no pet” clause is one good way for property owners to empty a building before it’s put up for sale, or to push out low-rent tenants in a gentrifying area. Pets also hamper tenants from finding any housing at all — about half of Los Angeles’ rental units and most homeless shelters don’t allow them. The federal Fair Housing Act requires landlords to make “reasonable accommodation” for tenants with physical or mental disabilities, a requirement that includes accepting certified service or emotional support animals. But tenants can’t insist on rights if they don’t know they have them. Enter Prado’s public interest law firm, the Housing Equality and Advocacy Resource Team (HEART), and the legal services offered by the Inner City Law Center via DDR’s Pet Resource Center on Skid Row. These parallel efforts may represent the first time no-cost attorneys have focused solely on pets as the driver of housing problems. They also mark a powerful merger of movements: the struggles for social justice and for animal welfare. The South Los Angeles Animal Shelter, located on 60th St. near Western Ave., echoes with the crash of bottles from a next-door recycling plant and the frenzied barking of 300-plus dogs. On a recent fall day, Prado was conducting business on a folding table near the shelter’s intake office, armed with a laptop, phone and legal forms. Her first client, referred by an animal rescue group, was a Latina in her 40s who’d brought her teenage daughter and a thick file folder of papers. Their landlord had sent a “Notice to Quit” the $642-a-month apartment below Baldwin Hills that the mother had rented for decades because of a terrier named Cookie. “But we’ve had the dog for five years!” she told Prado, adding that it had been classified an emotional support animal for her daughter, who was being treated for anxiety and depression. The girl said nothing but looked down at her hands. Two women, currently employed, appeared with a dog and a blizzard of contradictory notices about having to leave their Boyle Heights rental. Prado got to work. Since 2013, the organization’s “intervention program” at the South L.A. Animal Shelter has helped keep more than 7,000 animals out of the always-crowded facility by giving financial and other tangible assistance to struggling pet owners who are considering a pet surrender. The program, offering everything from money for reclamation fees to vouchers for vet care and even construction of dog-proof fences in open yards, has been widely imitated; programs based on Weise’s model exist at several Los Angeles-area shelters, as well as in other cities and states. Over time, intervention program counselors have repeatedly seen families forced to choose between their housing and their animals’. The problem is widespread. A survey by the National Council on Pet Population Study and Policy found the top two reasons for surrender of both dogs and cats were “moving” and “landlord not allowing pets.” In a 2015 motion, Los Angeles City Councilmember Paul Koretz noted that “since 2011, at least 22.6 percent of relinquished dogs and 18.6 percent of relinquished cats” had been turned over to city shelters because of tenancy restrictions. Prado, who’s got a 9-ish-year-old pitbull named Falcor that she rescued from the side of a freeway, felt the same. “Lori brings services together that no one else in the animal advocacy world would have thought were joined,” she says. The Pet Resource Center began the following year as a collaboration between Weise, the L.A. Animal Services Department and Inner City Law. In 2018, Prado left to start her own practice; her current clients come through shelter intervention counselors, rescue groups and community pet care clinics. One strength of this strategy, its ability to organize without anyone noticing, comes from meeting clients “where they are,” as Weise would put it, and in settings that have nothing to do with their legal issues. Another strength is the strategy’s logic. Humans evicted because of animals face predictable financial and emotional consequences, including job loss, depression, poverty. Eleven percent of Los Angeles County’s unsheltered homeless directly cite eviction or foreclosure as responsible for putting them on the street. Animals made homeless when their people lose housing face life in a shelter cage. Keeping dogs out of shelters and keeping people off the street are part of the same fight. In August, the city of Los Angeles City Council Housing Committee recommended that the city explore a housing “right to counsel” ordinance that would guarantee legal representation to low-income tenants facing eviction. For tenants, that would be a game changer. Meanwhile, in less than two years, the various members of the Pet Resource Center legal team have successfully fought 79 pre-eviction notices, defended clients in eviction court a dozen times and kept 113 animals at home and out of shelters. Behind the numbers are faces human, canine: The man who’d gotten a 24-hour notice to get rid of his beloved small dog, Champagne. The single mother with a dog and three kids, one disabled. The family of five and dog terrified of losing a rent-controlled Wilmington apartment — who later returned to offer Prado flowers and a thank-you note. And the Baldwin Hills-area mother and daughter and their dog, Cookie; Prado’s emailed response to their landlord’s attorney went unanswered, her client’s next rent check was cashed, and the problem just went away.